I don’t know what is going on lately, but yes, I am totally and completely aware that there is not as much food as there used to be on this food blog. 1. I have made several flops, and I have made several repeats over the last few months. 2. I have 81 drafts half-written in my drafts folder, and very few of them have anything to do with food. So if you stick around, dear readers, you may have to endure some non-food related posts for a little bit. Mixed in with the usual fare, of course. 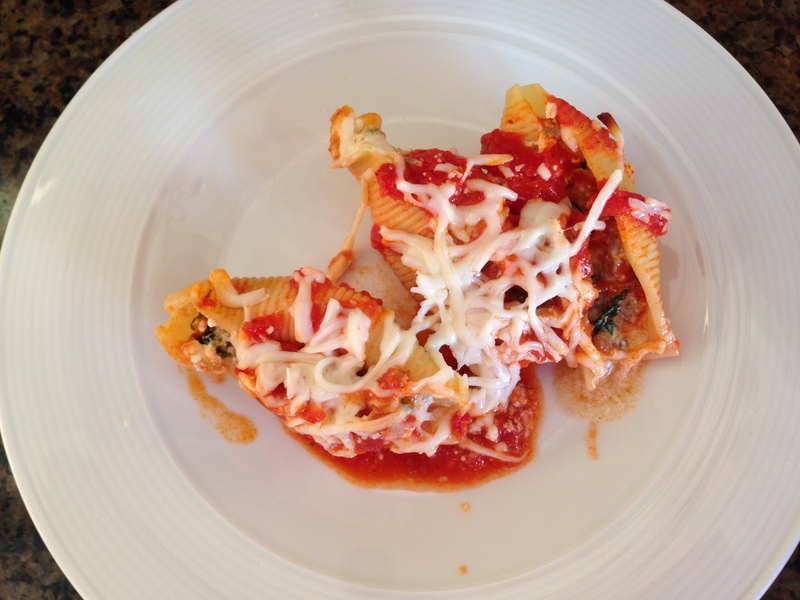 Our dinner fare the other night was sausage and kale stuffed shells, from Shutterbean. I’m on a mission to enjoy kale because you’re supposed to enjoy kale, right? In this dish, it’s chopped up small and mixed with sausage and ricotta cheese, not to mention stuffed inside pasta, which is a winning way to serve just about anything. In a medium non-stick skillet, heat 1 tablespoon of olive oil over medium high heat. Add Italian sausage and a heavy pinch of red pepper flakes and cook sausage, breaking up into small bits with a wooden spoon, about 4-5 minutes. Add chopped onion and sauté with the sausage until translucent, 2-3 minutes. Follow with the chopped kale and continue to cook until kale softens, another 3-4 minutes. Add in minced garlic and cook for another 2 minutes, making sure not to brown garlic. Turn off heat and let sausage & kale mixture cool. When cool enough to handle, place the sausage & kale mixture on a cutting board and roughly chop for filling. In a large bowl transfer sausage & kale mixture and stir in ricotta, egg, oregano, basil, Parmesan cheese and Italian parsley. Season with freshly cracked pepper and a pinch of kosher salt and stir evenly to combine. Cook jumbo shells in a large pot of boiling water according to instructions. Drain noodles, and lay shells on a baking sheet lined with paper towels. Set aside to cool. Line the bottom of a 13 x9 baking dish with 2-3 cups marinara. To stuff shells, fill each shell with 1 1/2 tablespoons of the sausage kale mixture. Layer shells in the prepared baking dish. 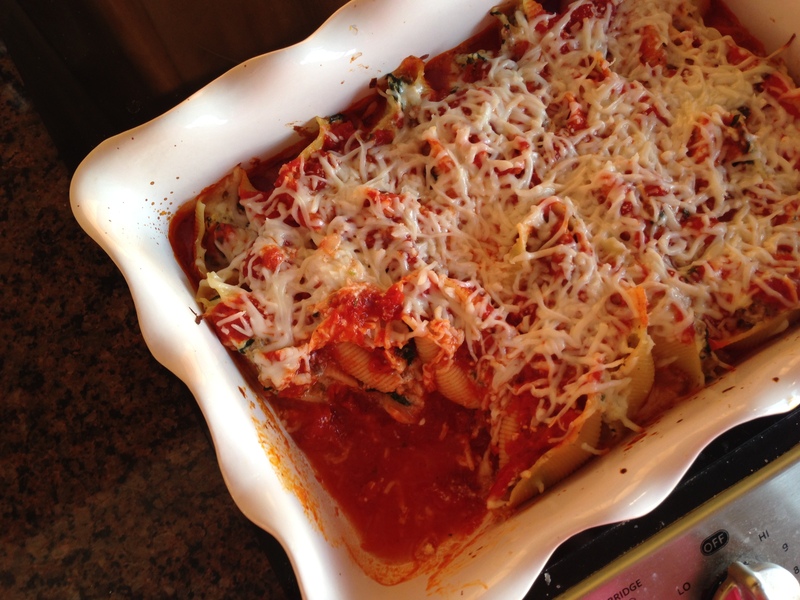 When all shells are stuffed, pour remaining marinara on top, making sure to cover each shell. Sprinkle the top with mozzarella, cover baking dish with aluminum foil and transfer baking dish to an oven to bake for 30 minutes. Take off aluminum foil and cook for another 5-10 minutes until cheese is lightly browned and sauce is bubbling. This entry was posted in savories and tagged tracy shutterbean. Bookmark the permalink.